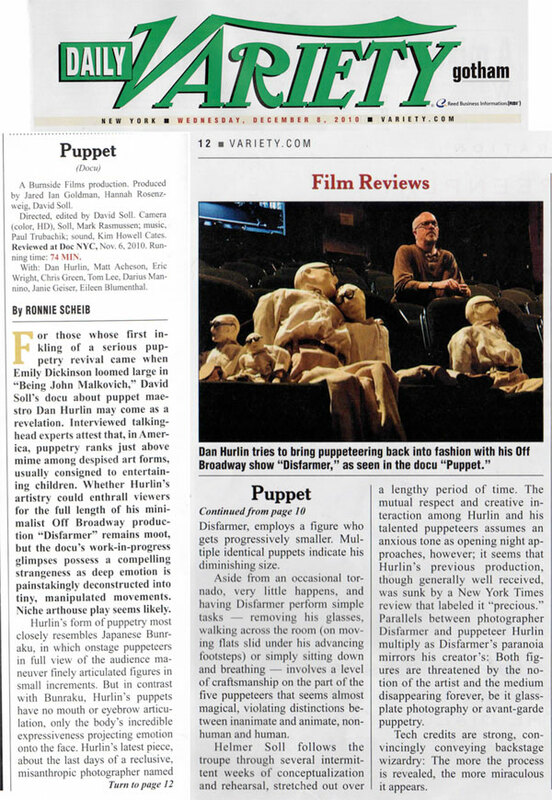 For those whose first inkling of a serious puppetry revival came when Emily Dickinson loomed large in “Being John Malkovich,” David Soll’s docu about puppet maestro Dan Hurlin may come as a revelation. Interviewed talking-head experts attest that, in America, puppetry ranks just above mime among despised art forms, usually consigned to entertaining children. Whether Hurlin’s artistry could enthrall viewers for the full length of his minimalist Off Broadway production “Disfarmer” remains moot, but the docu’s work-in-progress glimpses possess a compelling strangeness as deep emotion is painstakingly deconstructed into tiny, manipulated movements. Niche arthouse play seems likely. Hurlin’s form of puppetry most closely resembles Japanese Bunraku, in which onstage puppeteers in full view of the audience maneuver finely articulated figures in small increments. But in contrast with Bunraku, Hurlin’s puppets have no mouth or eyebrow articulation, only the body’s incredible expressiveness projecting emotion onto the face. Hurlin’s latest piece, about the last days of a reclusive, misanthropic photographer named Disfarmer, employs a figure who gets progressively smaller. Multiple identical puppets indicate his diminishing size. Aside from an occasional tornado, very little happens, and having Disfarmer perform simple tasks — removing his glasses, walking across the room (on moving flats slid under his advancing footsteps) or simply sitting down and breathing — involves a level of craftsmanship on the part of the five puppeteers that seems almost magical, violating distinctions between inanimate and animate, nonhuman and human. Helmer Soll follows the troupe through several intermittent weeks of conceptualization and rehearsal, stretched out over a lengthy period of time. The mutual respect and creative interaction among Hurlin and his talented puppeteers assumes an anxious tone as opening night approaches, however; it seems that Hurlin’s previous production, though generally well received, was sunk by a New York Times review that labeled it “precious.” Parallels between photographer Disfarmer and puppeteer Hurlin multiply as Disfarmer’s paranoia mirrors his creator’s: Both figures are threatened by the notion of the artist and the medium disappearing forever, be it glass-plate photography or avant-garde puppetry. Tech credits are strong, convincingly conveying backstage wizardry: The more the process is revealed, the more miraculous it appears. Camera (color, HD), Soll, Mark Rasmussen; music, Paul Trubachik; sound, Kim Howell Cates. Reviewed at Doc NYC, Nov. 6, 2010. Running time: 74 MIN.